We believe that one of the charms of Minsk is its Soviet heritage. If you want to discover the Soviet part of Minsk, we recommend you visit these places. This is one of the longest streets in Europe which is just over 15 km long and it has changed names 14 times. 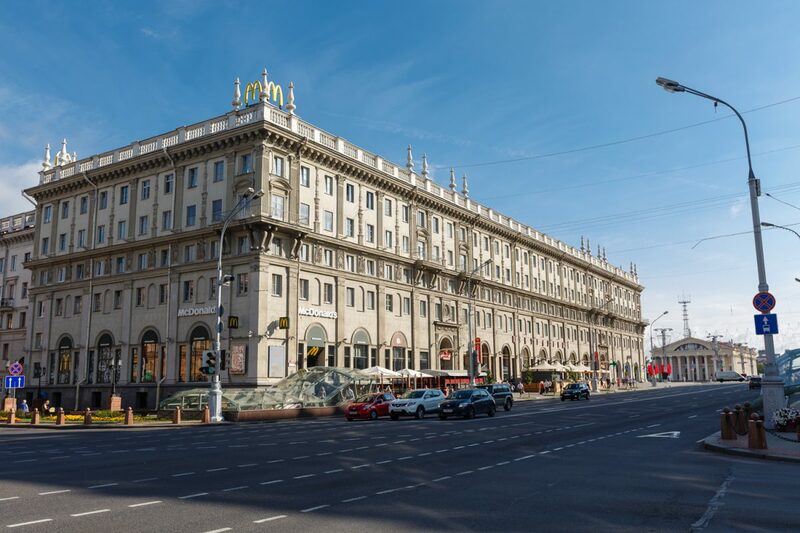 This street is one big Stalinist architecture paradise. A majority of Minsk was destroyed during the WWII and rebuilt during the Soviet Era with the help of citizens and prisoners of war (POWs). Check out buildings of KGB, GUM warehouse and other awesome Soviet architecture located there! Get a real Soviet experience here! Regular people in USSR couldn’t really afford to eat in restaurants, so this kind of place would have mostly been visited by intelligentsia. Its lavish ceremonial interior décor takes you back to another era and time, which only a few got to experience. Try out there popular in post Soviet countries salad ‘Olivie’ and don’t forget to take in the atmosphere. 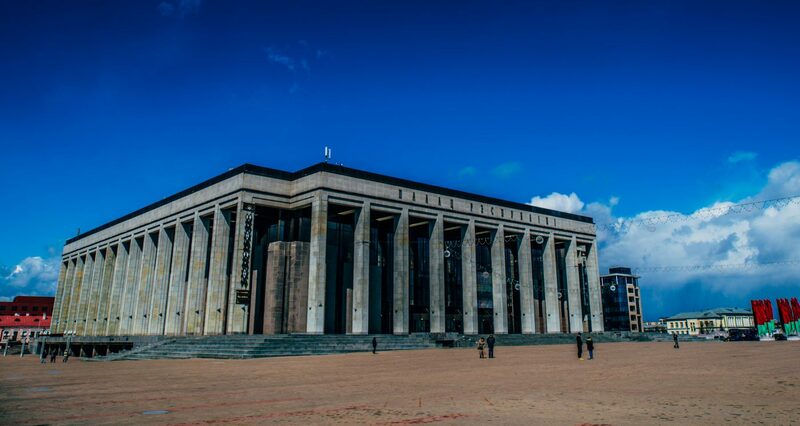 ‘The Palace of the Republic’ is not to be missed even if you’re only spending a few hours in Minsk. It’s very centrally located, huge, grey, and impressive. You might wonder what happens inside this grand Soviet building? Well it might look a bit dark and cold, but Surprise, this is the place where people dance, listen to music, go to the movies, and organise all kinds of events. It’s the cultural centre of Minsk! So check it out! This museum was built in 2014 and wonderfully illustrates Belarus’ role during WWII. Inside there is an interesting collection of contemporary guns, tanks, uniforms, documents, and other trinkets from the war. If you are not a big fan of war memorabilia or already have been to a few war museums, we recommend walking around the building! The museum building itself is quite unique and overwhelming, with great monuments and interesting architectural features. This place has been and still is the soul of Minsk. From the outside it doesn’t really look like a bar, but don’t be fooled! A local’s tip is to get yourself a drink at one of the kiosk style stations and drink it in front at their special tables. This is a great way to meet different locals and drink cheap beer. You can talk inside to artists, alcoholics (mostly artists), poor students, professors, businessmen, and many other interesting people, and don’t forget to pay extra attention to the interesting Soviet decoration and pictures on the wall.